Despite little promotion by the UFC, there is, in fact, a pay-per-view card on Saturday, May 12. UFC 224 takes place in Brazil and features a world title fight as its main event, no less. In front of what will no doubt be a rowdy and enthusiastic Brazilian crowd, UFC bantamweight champion and native Brazilian Amanda Nunes defends her belt against Raquel Pennington. This will be the champ’s first title defense since her close victory over Valentina Shevchenko last year, and it will be Pennington’s first-ever title opportunity. This is Pennington’s first fight since defeating former champion Miesha Tate at UFC 205 in 2016. Will Nunes defend her belt for the third time? Or will the underdog Pennington pull off what would be considered a huge upset? The co-headliner is a likely title eliminator at middleweight, where Ronaldo “Jacare” Souza will face Kelvin Gastelum. 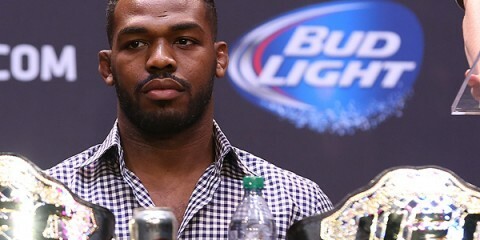 Both fighters enter this contest with legitimate claims to a middleweight title shot. Jacare has only lost twice since joining the UFC in 2013. The Brazilian is coming off an emphatic first-round knockout of Derek Brunson. Gastelum seems to have found a home competing at 185 pounds. 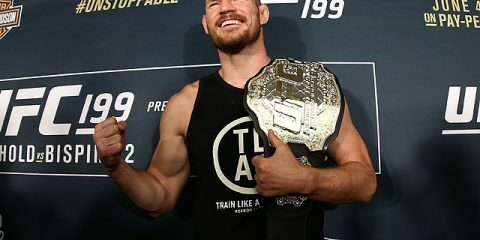 The Ultimate Fighter 17 winner is coming off a first-round knockout last year of former middleweight champion Michael Bisping. The rest of Saturday’s card features fighters well known to Brazilian fans, including Vitor Belfort, Lyoto Machida and John Lineker, among others, as well as the second UFC bout for highly regarded prospect Mackenzie Dern. The UFC Fight Pass preliminary card begins at 6:15 p.m. ET on Saturday, followed by the remainder of the preliminary card on FX at 8 p.m. ET. The pay-per-view main card kicks off at 10 p.m. ET. Combat Press writers Chris Huntemann and Kyle Symes preview the action in this edition of Toe-to-Toe. 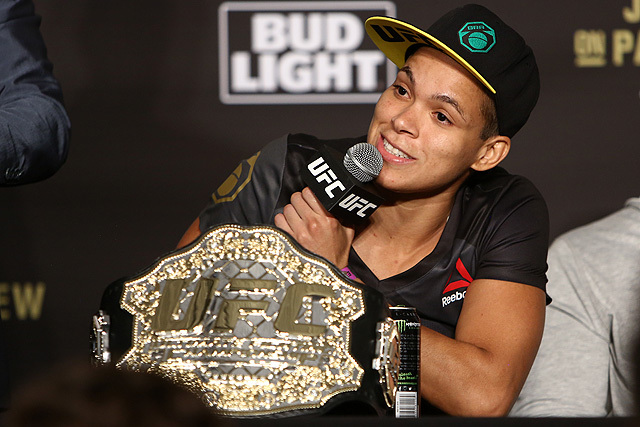 UFC women’s bantamweight champion Amanda Nunes has spent the last three years dominating her competition and nearly two years reigning over the division. 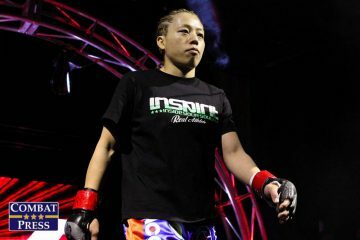 Will she add to her legacy against challenger Raquel Pennington? What route does Pennington have to victory? Symes: Under normal circumstances, it’d be hard for most fans and analysts to pick Pennington over Nunes based on what we’ve seen from these ladies. However, given the fact that Pennington is coming back from a major surgery and hasn’t fought since November 2016, I don’t see how anyone could feel confident picking Pennington in this fight. Nunes has looked the part of an unconquerable champion since rising to the top of the division, but if I had to pick one way for Pennington to take out “The Lioness,” then it would have to be for her to make this into a boring fight. Whether that’s by clinching Nunes against the fence or going to the “snuggy offense” of maintaining top position, Pennington’s best chances at victory will be to get Nunes either on the ground or in a war of attrition against the cage. Nunes simply has too much power, especially in the early rounds, for Pennington to win a striking affair. However, there’s a chance Nunes gets herself winded quicker by getting hyped up from the Brazilian crowd, which means Pennington will likely have to weather an early storm just to try to drag Nunes to deeper water. Pennington is a tough fighter. She has wins over some big names in the division. However, she is coming off a major injury and nearly one and a half years of time away from the cage, so her chances are not great for beating Nunes in this one. Huntemann: My esteemed colleague and I start off this preview on the same foot. On paper, this looks like a pretty lopsided match-up. How tough can Pennington be with an overall record of 9-6? The replays of Nunes figuratively knocking Ronda Rousey into the loving arms of Vince McMahon are still played pretty frequently, and Nunes just bested her top rival, Valentina Shevchenko. By all accounts, this fight should be a walk in the backyard for the champion. But let’s take a little closer look, shall we? Pennington has won five out of her last six fights, dating back to 2014, with the lone loss coming to former champion Holly Holm in Holm’s UFC debut and what was a very close fight. For the record, I still believe Pennington won that one. 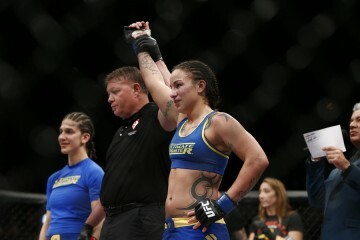 Pennington’s last win came against yet another former champion in Miesha Tate. Pennington simply outworked and grinded out Tate, who appeared to already have one foot out the door to retirement at that point. If Pennington closes the distance against Nunes and either gets her down to the mat or keeps the action against the cage and plodding, there is a chance that Pennington can pull it off. However, she will have to make sure to stay active against the cage, or else the referee might indirectly take away Pennington’s biggest tool. Nunes is one of the best on the ground, as we saw when she choked out Tate to claim the bantamweight title almost two years ago. Pennington will give it all she has and probably take some shots better than many of Nunes’ prior opponents, but Nunes looks to be on the top of her game right now. Nunes retains her title. This card is full of high-level middleweights. There’s the co-headliner between Ronaldo “Jacare” Souza and Kelvin Gastelum. Veterans Lyoto Machida and Vitor Belfort meet earlier in the evening. The lineup also features, among others, rising contenders Cezar “Mutante” Ferreira, Karl Roberson, Jack Hermansson and Markus Perez. Which middleweight fighter makes the biggest statement on Saturday night? Who turns out to be the biggest disappointment? Huntemann: Jacare will make the biggest statement. 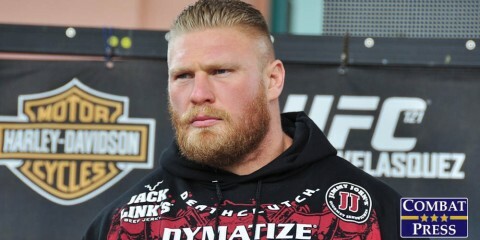 He will defeat Gastelum and become the new No. 1 contender in the middleweight division. Souza has looked like a brand-new fighter over his last couple fights. Jacare just ran into a fighter in current champion Robert Whittaker who was peaking at the right time. Outside of the Brazilian’s performance against Whittaker, he has looked every bit the dangerous fighter that we know him to be. Jacare looks like a fighter that you just don’t want to be in the Octagon against. Gastelum is a dangerous fighter and looks better than ever since deciding to stay at 185 pounds — for now, at least. It wouldn’t be a surprise if he caught Jacare with one clean shot and put his lights out. However, that’s not how this one will go. Now is the time that Jacare solidifies his championship bona fides. Symes: This fight is going to tell us a lot about both competitors. This could very well be Jacare’s final run at title contention. For Gastelum, this is the opportunity to take out a top-ranked guy and assert himself into the crowded middleweight title picture. Jacare has looked the part of an elite fighter since joining the UFC’s ranks after coming over from Strikeforce. Widely considered to be among the best Brazilian Jiu-Jitsu practitioners to enter the MMA game, Souza has also displayed the ability to shut anyone’s lights off if opponents slack on their striking defense. The loss to the aforementioned Whittaker was bad, but that wasn’t the real Jacare. The same can be said of Gastelum’s return to middleweight. He defeated Tim Kennedy, but Kennedy was well on his way out of the MMA game. He also defeated a TRT-less Belfort and a Michael Bisping who probably shouldn’t have been in the cage in the first place. The loss to Chris Weidman was an eye-opener, because it showed that Gastelum might struggle with the elite middleweights who are not only talented, but massive for the division. Is Souza able to utilize a grappling-heavy game plan to wear Gastelum down? Or will Gastelum’s speed and pace show that Jacare isn’t capable of hanging with the young up-and-coming fighters? It’s a fascinating fight precisely because of all these storylines. With that said, Jacare will do enough to earn a victory. Gastelum’s pace will prove to be a struggle for Jacare early, but expect the Brazilian to drag his foe to the mat, where the crocodile will strike for a victory. 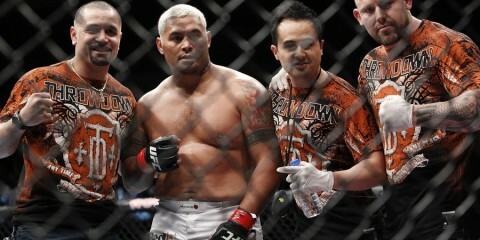 In regards to who will be the biggest disappointment, I feel like Cezar “Mutante” Ferreira’s UFC run has been fairly disappointing considering the hype he used to have surrounding him. It seems like every time he gets any kind of momentum, he stumbles. He had a solid run to open his UFC career and then got flatlined by C.B. 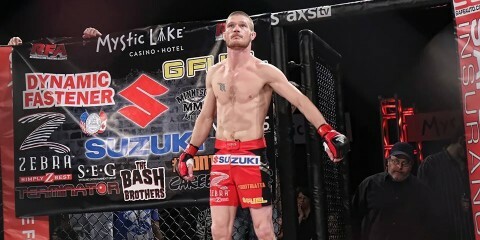 Dollaway in 39 seconds. 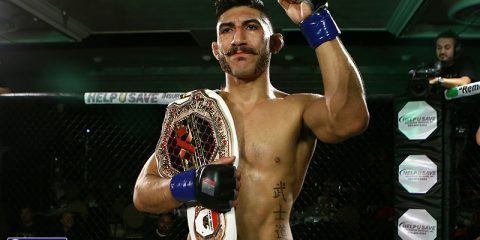 After picking up a win in his next fight, Ferreira went through a disastrous 2015 campaign in which he was knocked out in back-to-back fights. Three straight wins in 2016 were derailed when he lost to Elias Theodorou to open 2017. Is he ever going to put it all together and finally validate the hype? Who’s the biggest winner at UFC 224? Symes: Amanda Nunes. She’s been on the wrong side of UFC President Dana White’s wrath — remember when she was never going to headline another pay-per-view? — and has yet to receive any kind of major promotional push from the company. A win in front of the Brazilian fans should produce a moment for the UFC to capitalize on, especially if Nunes calls out Cristiane “Cyborg” Justino for a superfight down the road. Huntemann: Once again, we’re on similar wavelengths. It’s not surprising that White already backtracked on his claim that Nunes would never land another pay-per-view main event. That guy has pretty much mastered the art of moonwalking on everything he says. Nunes should defend her title in front of her home crowd, and hopefully she does call out her fellow Brazilian Cyborg in what would be the biggest fight the UFC can make for either competitor right now. 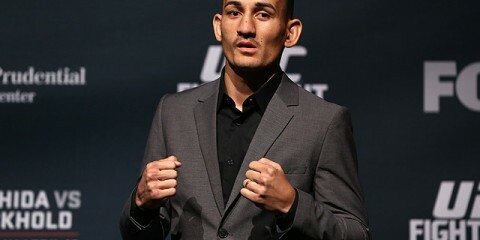 Who’s the biggest loser at UFC 224? Huntemann: It depends on how you define “loser” for this question, I suppose. In my view, it will be Vitor Belfort. It’s widely reported that his fight with Lyoto Machida will be his last one. Belfort will lose this fight, quite possibly via finish. That isn’t exactly the way he would want to end his career, I reckon, and especially in front of his countrymen. It shouldn’t diminish everything that he has accomplished in his incredible career, though. Symes: That’s a good pick. Honestly, you could go either way in that fight. Both guys are legends, but with their declining performances, a violent finish by either man could be tough to watch. Everyone competing on this card could be considered the biggest loser. UFC 225 has the makings of being a mega-event, and it seems like everyone is just counting down the days until June 9. Raquel Pennington is another big loser here. She was on a nice run before the injury and now faces a dominant champion who seems to be on a different level than the rest of the division. Pennington’s toughness will win over some fans and hopefully some goodwill to ensure she stays near the title picture down the road. Symes: Junior Albini and Aleksei Oleinik. Albini has sounded like he’s going to look like a different fighter than the one we saw against Andrei Arlovski, but Oleinik has a knack for finishing opponents in exciting fashion. Huntemann: You could stand to pay attention to the FX prelim bout between Elizeu Zaleski and Sean Strickland. Both guys are riding high right now. Zaleski has won four straight, and Strickland has won four of five. The welterweight division is still fairly crowded, but a good performance by either fighter can only help them boost their stock. This could be a pretty good scrap to help kick off the evening’s cable-TV festivities. Huntemann: This card takes place on Mother’s Day weekend, right? So, what the hell. Take Mom out to watch some fights. Show that special lady in your life, the one who gave birth to you, what it is that you do in your spare time when you’re actually supposed to give your Mom a call every once in a while. Symes: Your poison of choice. The card has some interesting fights, but few of them are “must-see” affairs. Most UFC cards tend to be marathons, so pairing this with some good alcohol or herbal remedies should help pass the time if things start to drag.